colored fringes symmetrically disposed about the central white fringe, the succession of colors being exactly the same as in the case of thin films (c/. Plate II). width of the fringes is proportional to the wave length of the light, and inversely proportional to the angle between the pencils. 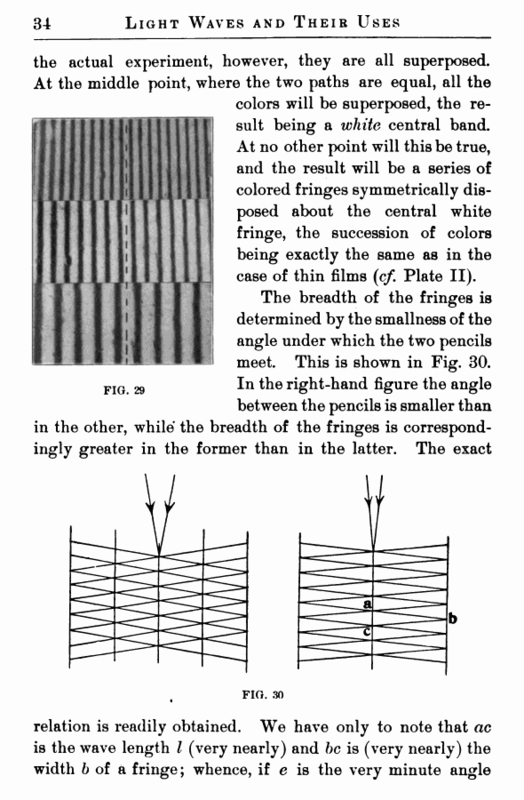 Thus, if the pencils converge from two apertures a quarter of an inch apart, and meet at a screen ten feet away, the breadth of the fringes will be one-hundredth of an inch. The importance of using a very small angle will be noted. 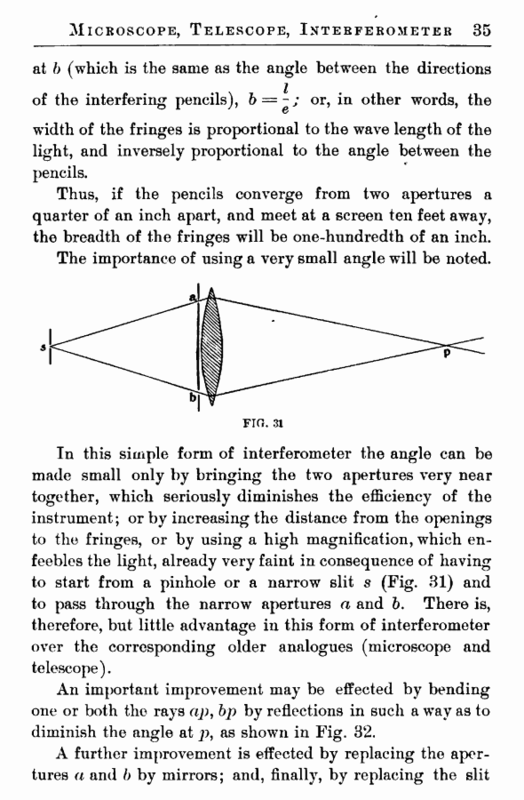 In this simple form of interferometer the angle can be made small only by bringing the two apertures very near together, which seriously diminishes the efficiency of the instrument; or by increasing the distance from the openings to the fringes, or by using a high magnification, which enfeebles the light, already very faint in consequence of having to start from a pinhole or a narrow slit s (Fig- 31) and to pass through the narrow apertures a and b. There is, therefore, but little advantage in this form of interferometer over the corresponding older analogues (microscope and telescope). An important improvement may be effected by bending one or both the rays ap, bp by reflections in such a way as to diminish the angle at p, as shown in Fig. 32.